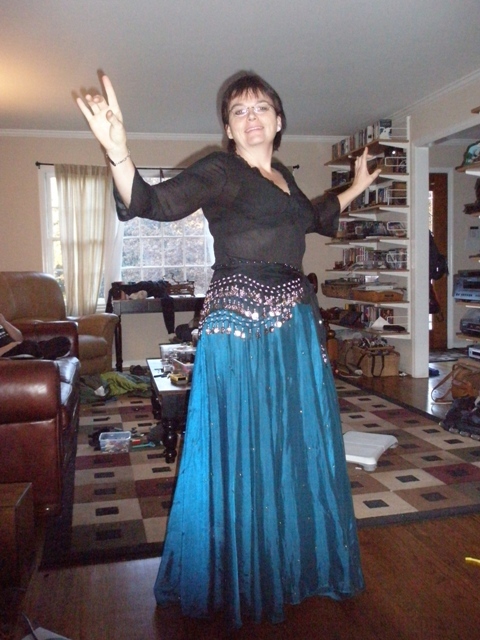 I had the best time yesterday shopping for a belly dancing costume. I didn’t want to spend a lot, since I’m not at all sure I’ll continue taking classes after this one is over. But everyone says the people with the costumes have the most fun and do the best. I think it certainly helps get you in the mood. I already had a coin sash that I brought back from Singapore last year. And I found the skirt and the top at the Goodwill that I just love. Then I just had to buy the veil. I had some great silk I wanted to use (also from the trip to Asia last year) but the teacher said it was too heavy. After trying out the new veil, I can see what she means. This one is so light, it just floats up in the air and you are really just lifting your arms, and don’t feel the weight of the veil at all. So that’s my costume and in a few minutes I’ll be leaving for class. I had to work all morning, software release weekend, so this will be a nice way to wind down and enjoy this beautiful afternoon. Have a great Sunday and talk to you tomorrow! Oh my goodness, you are floating!!! PS And by the way, hon, your ribs are showing…. RIBS. Awesome, awesome picture and yes R-I-B-S!!! You look great and have worked so hard! Glad you are enjoying the dancing!